The locals all know about it–but the casual visitor may not discover this one-of-kind dining establishment located on Pawley’s Island. If you go to Pawley’s Island, don’t miss this wonderful and unique dining experience. Frank’s opened in the 1930’s as Marlow’s Supermarket and was a favorite local spot for making phone calls (it was the only phone in Pawley’s at the time), buying groceries and catching up on gossip. In the 1970’s Salters McClary, a high school student, worked summers for Frank Marlow. After graduating from college and returning to Pawley’s Island, Salters approached Marlow (who was retiring) about leasing the building and opening a restaurant. In 1988 Salters and Elizabeth McClary opened a restaurant and named it Frank’s after Mr. Frank Marlow. Today Frank’s is a beloved establishment among the locals and one of the best restaurants in the Carolinas. 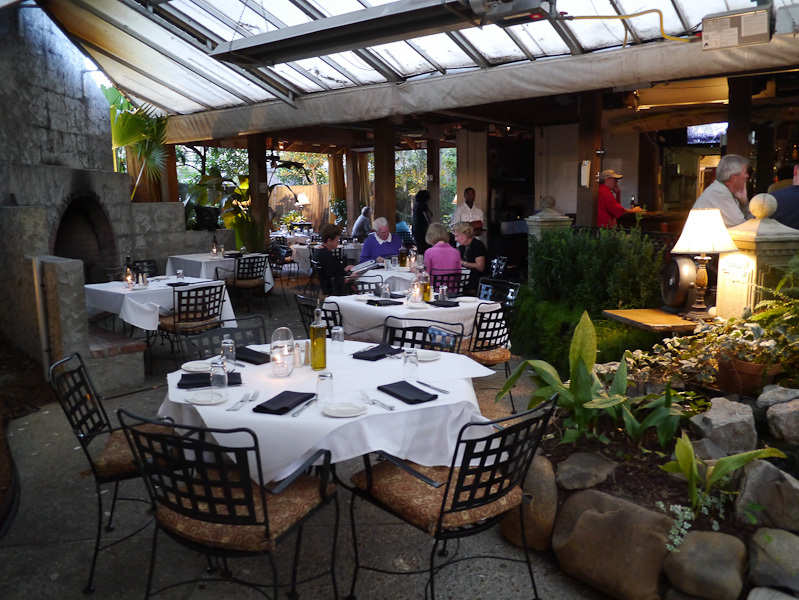 Frank’s offers an indoor Bistro, but Frank’s Outback-an outdoor covered dining area–offers a great atmosphere all year round. On a recent visit to Frank’s Outback, my husband and I enjoyed dining in this unique outdoor setting. The menu, which changes seasonally, offers upscale dining as well as Wood Fired Pizzas. Frank’s also offers a wide selection of wines, or you may bring your own (there is a corkage fee). My husband and I ordered two appetizers and sampled each others. The Seared Ahi Tuna Stack with Crispy Wonton, Avocado Cream Cheese and Spicy Miso Mayo and the Seared Jumbo Sea Scallop with Roasted Pineapple and Jalapeño Salsa. 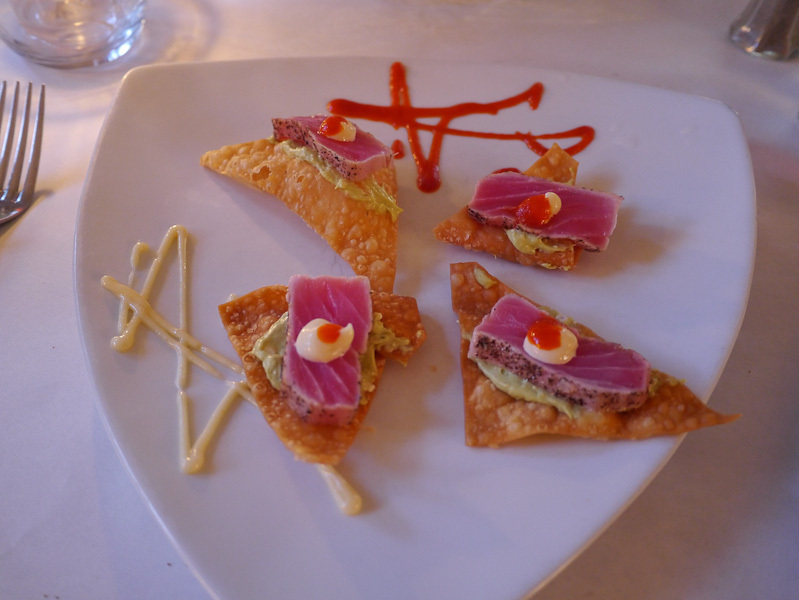 The presentation was beautiful and the appetizers were perfectly balanced for flavor and heat. For the main course, my husband ordered one of the house favorites, the sautéed Jumbo Lump Crab Cakes with Carolina Stone Ground Grits, Braised Local Collards and Whole Grain Mustard Cream Sauce. Coming from the Maryland area where Old Bay and Crab Cakes are synonymous, we had our doubts, since we’ve found that most Southern Crab Cakes (Charleston style) are smothered in sauces and spices, masking the true crab taste. Not so with this dish–it got a thumbs up from both of us. I ordered the 8 oz. Filet of Beef with Green Peppercorn Pan Sauce and Garlic Mashed Potatoes. The beef was full of flavor and melted in my mouth! I also ordered the Insalata Capress (not on the menu, but just ask for it) which was the best I’ve ever had. 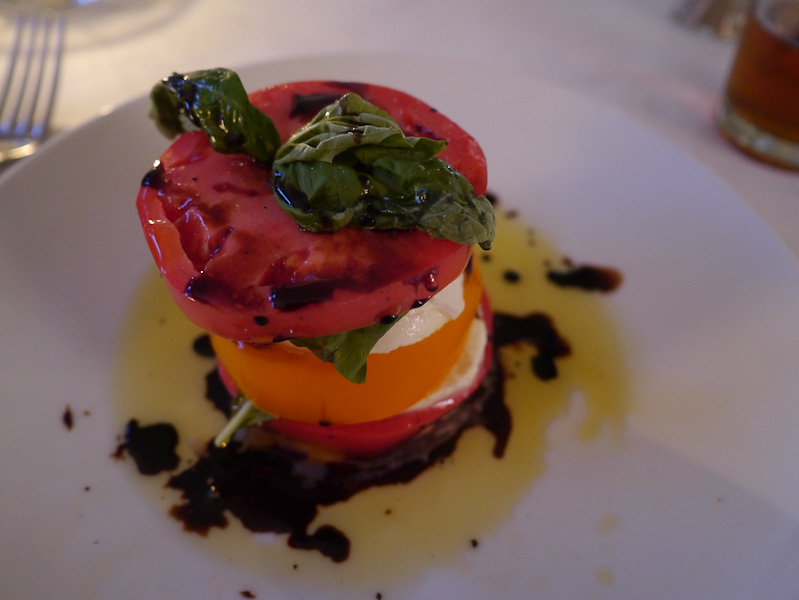 Luscious red and yellow tomatoes stacked with mozzarella cheese and basil with a well-balanced balsamic glaze. For dessert, we split the 14-Layer Caramel Cake. Made locally in Pawley’s Island, this cake was heavenly–with just enough sweetness from the layers of caramel icing to satisfy my sweet tooth. Frank’s serves dinner beginning at 5:30 (bar opens at 4:00). There is live music on weekends. Reservations recommended. (10434 Ocean Highway, 843-237-1777). This entry was posted in Food and Wine, Restaurant reviews, South Carolina and tagged food & wine, Pawley's Island, Restaurants, SC. Bookmark the permalink.